It has been said, “Two men look through the same jail cell walls, one sees mud and one sees stars.” Certainly, this is the way that I see the Fresno parks sales tax initiative. First, I think some background is in order. At the ultimate fallout of the Great Recession, Fresno’s city government was debt-laden. This was the result of expensive borrowing to provide, among other things, minor infrastructure patchwork. At that point, nearly every budget line item was on the chopping block. It goes without saying that the parks department wasn’t remotely close to the highest priority. Budget figures from 2009 through today are evidence of the department’s decimation. For the layman, the brown lawns at Fresno’s parks served as the obvious sign. But a fundamental question must be asked: Who will go to parks if they are not safe? 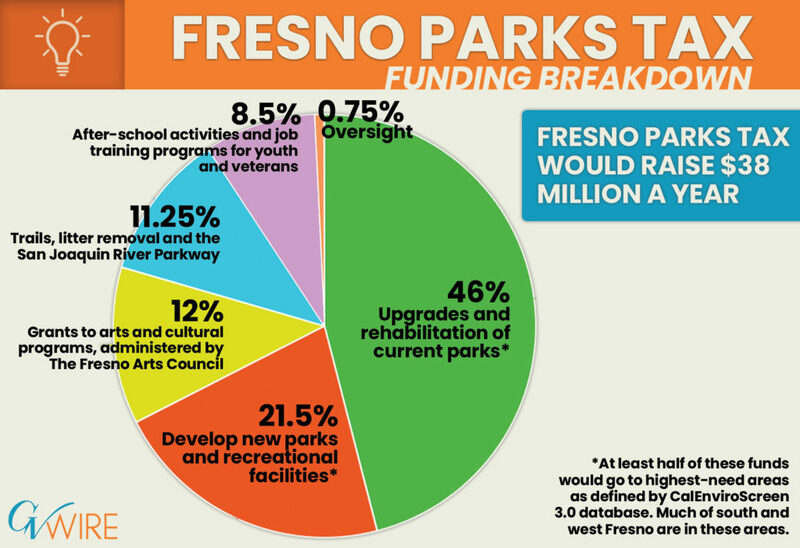 Years of Fresno’s poor ranking on parks surveys led to a push by then-Fresno Unified School Board President Luis Chavez and myself to open up Fresno Unified playgrounds, fields, and pools for weekend and after-hours use to help ease the burden off the parks department. After all, these facilities do belong to the public. Elsewhere, the budget for the Fresno Police Department was placed on life support. Due to budget constraints, taxpayers had to reckon with the notion that the burden of ensuring public safety would be temporarily shared between a leaner roster of officers and residents. The story of Fresno’s financial turnaround, however, was written at the negotiating table. The path to restored credit ratings, rosier financial health, and improved services began with one man: Jacky Parks. As the then-president of the Fresno Police Officers Association, Parks brokered a deal to take the brunt of the fiscal fallout. Officers elected to forego raises and other incentives, and the department phased out positions to ease payroll and benefits costs — all to help the city get back on its feet. Meanwhile, Fresno’s municipal government pension system is nationally recognized for its financial health. Now we focus on today, where a concerted push — sponsored by nonprofits and donors — funds an initiative to revitalize, maintain, and build parks. The effort has been nothing short of impressive: polls funded, thousands of signatures gathered. This fight has pitted Mayor Lee Brand against former Mayor Ashley Swearengin over the city’s priorities. The parks effort has been nothing short of impressive: polls funded, thousands of signatures gathered. While Mayor Brand’s varying stances on what do with a proposed sales-tax hike made little headway, it did force a reckoning and a bit of attempted legislative sausage-making with Swearengin and other proponents of the parks tax. Attempting to “split the baby” between 60% funding for parks and 40% for public safety (likely acceptable to Team Swearengin) or an even split between the two priorities (acceptable to Team Brand) led nowhere. Facing the most dangerous environment since the passage of the Crime Bill, thanks in part to AB109 and Propositions 47 and 57, shouldn’t the men and women putting their lives on the line be entitled to a piece of the action? Those on the force took sacrifices when Fresno’s future looked more like those of Detroit and Stockton than of San Francisco. More importantly, these men and women make sacrifices every day at work. Don’t People Like Both Green and Blue? Businessman Brooke Ashjian represents Area 7 (Bullard High district) on the Fresno Unified School District Board of Trustees. The police department continues to suffer! The community doesn’t know the half of it, but the city leaders do. I would have loved to see the article have a pie chart on all the safety equipment that the police department has needed and still needs to compare to the parks pie chart! Much of it is the same ole stuff, finding money to pay for bullets needed for training, hand guns that are 7-8 years old and frequently malfunction during range training, firearms training was reduced from quarterly to three times a year, patrol vehicles once replaced at 90,000 – 100,000 miles now stay in service to 150,000 – 175,000 plus miles, finding money for ballistic vests is a struggle, the portable radio’s and a radio system continue to struggle, etc. If these officer safety issues and public safety issues under Mayor Brand look familiar to the same issues and struggles that occurred under Mayor Swearengin, it’s because they are! Politicians love to say they support law enforcement, they just do a poor job of following through with it. I’m voting “No” on any tax the benefits green space over the safety of the community, the safety of the officers, and the safety of my family.